Angel Delgadillo in his Seligman barber shop. He was born in the town in 1927, a year after Route 66 was designated as a federal highway. Seligman has been a focal point for waves of nostalgic travelers who returned to what's left of Route 66 and its roadside attractions. It helps that Seligman is on one of the longest remaining stretches of the highway. ​The unincorporated town is about 85 miles from Kingman. Add another 17 miles to the trip by driving on an old alignment of Route 66, now known as Crookton Road (Exit 139) that you pick up just west of Ash Fork. Seligman also stands out because of the Delgadillo family. 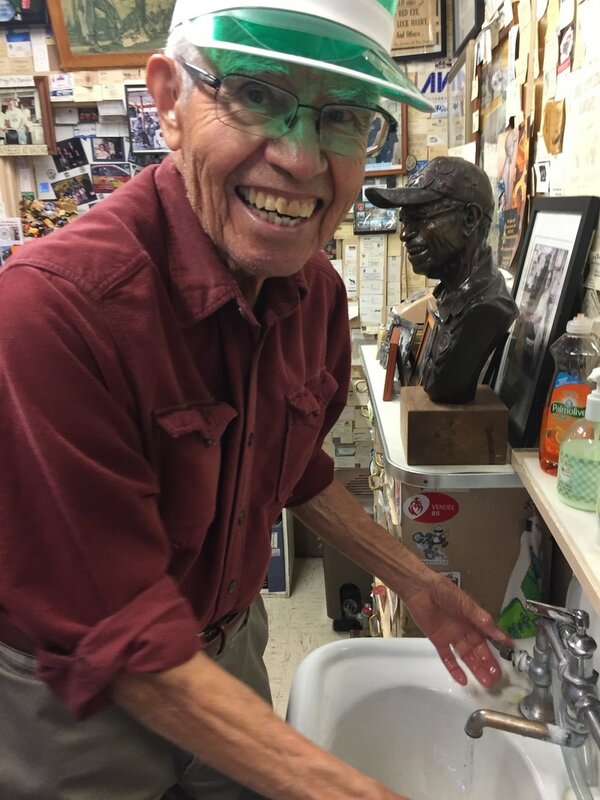 Angel Delgadillo, a local barber since 1947, founded the Historic Route 66 Association of Arizona and pushed for state and federal recognition of the historic highway in the late 1980s. As a child, he told me he recalled seeing flickering headlights of cars on Route 66 shining into his family's home and how he would make shadow figures on the wall. Angel's brother Juan Delgadillo built the Snow Cap Drive-in with salvaged lumber in 1953. 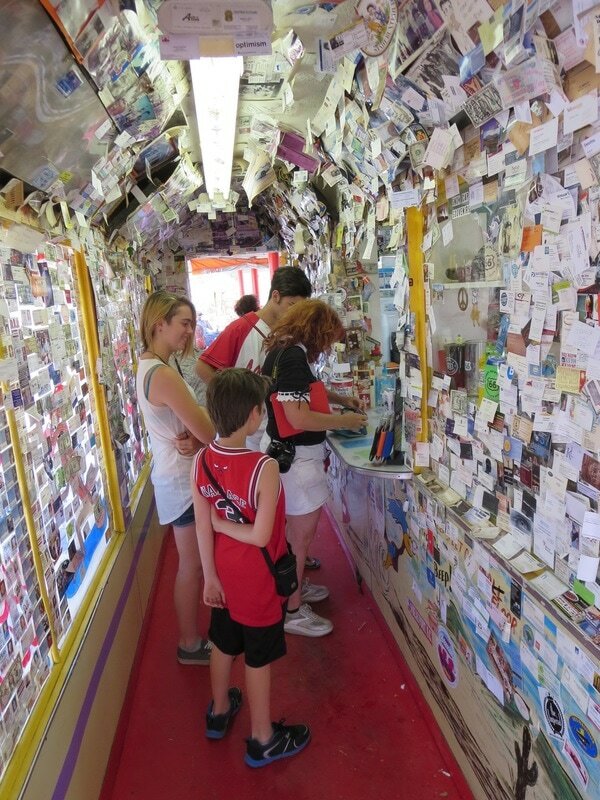 It has become an essential stop for Route 66 visitors. Juan was a jokester with a schtick for customers using doctored squeeze bottles of ketchup and mustard, frayed napkins and straws, and a Milkshake candy bar in a cup. He died in 2004. His children and grandchildren still operate the drive-in. Seligman, once known as Prescott Junction, was a railroad and highway town. It became a near ghost town after Route 66 was bypassed by Interstate 40 in 1978. Passenger rail service ceased in 1984 and the Santa Fe Railroad ended its operations in the town in 1985. But interest in historic Route 66 from all over the world has revived the town. All kinds of roadies on motorcycles, in vintage cars and on tour buses get their pics on Route 66 in Seligman. Juan Delgadillo, who built the Snow Cap Drive-in in 1953, had a reputation as a jokester. He entertained customers for decades before his death in 2004. Snow is a rarity in the high desert but a January 2017 storm left a few inches on Route 66 at the Snow Cap Drive-in with its collection of signs and oddities. Snow Cap patrons line up for ice cream amid a blizzard of business cards. A clean, well-lit motel and vintage neon sign on the north side of Route 66. Stagecoach 66 Motel is a 40-room property on the east side of Seligman.